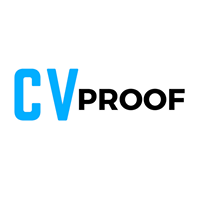 CVproof ICO – CVproof is a ‘Career Credentials Validation’ platform that operates on the Ethereum blockchain. The CVproof ICO aims to raise the necessary funds for the creation of a solution to the fraud and document loss that is prevalent in the current system. They will accomplish this by providing business owners with the means to verify the educational and career credentials of job applicants. Current CVs often contain a great deal of information, some of which is untraceable. It is labor-intensive for recruiters and potential employees to personally verify the data offered on the CV. They also will not necessarily know whether the references given are real. A great deal of time is wasted on skill relevancy confirmation due to the magnitude of CVs received. Research cited by Steven D. Levitt suggests that more than half of applicants provide false or inconsistent data on their CVs. Verifies all credentials listed on the CV including medical history, tertiary education and qualifications, references, employment records and job assessments. International restrictions such as time zones and lack of knowledge of the educational institutions of various countries. There can also often be delays in transferring and accessing necessary documents, which can be problematic for both the employer and applicant. 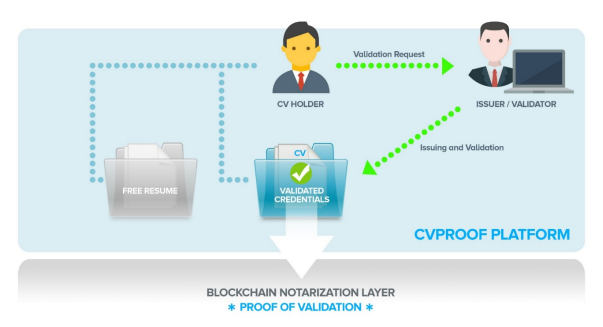 CVproof plans on creating a platform that uses a Proof-of-Validation consensus algorithm. This means that organizations such as universities, businesses and medical institutions will be able to store information and issue digital certificates and other types of documentation on the CVproof platform. Each document will be encrypted, thereby ensuring that the documents cannot be duplicated or lost. They will also be easily verifiable and accessible to platform users, including third parties who are granted access by both the institution and document owner. Institutions will benefit from this as it will increase time-efficiency for document storage, issuance, accessibility and hacking attempts. There will also be less opportunity for the kind of fraud that damage the institution’s reputation. CVproof also hopes to collaborate with various Human Resources Information System (HRIS) operators in order to embed their services into the HRIS software. They can then create a mutually beneficial exchange and sharing of data. HR personnel will then be able to access transcripts and other relevant documentation that they have been authorized to access, as well as submit relevant documents such as payment receipts, tax submissions and assessments into the system. This will offer companies the opportunity to increase the efficiency of their administrative processes and security of record keeping. On the employee’s side, all of these entries will ultimately make it easy for them to provide authentication of their educational, training and employment history. This is a result of the blockchain ledger-protocol which will make all of this data transparent and readily available to all agencies and businesses that have access to the API on CVproof’s platform. CVproof will profit by earning a commission fee for all services transacted on their platform. The fee charged will depend upon the type of service being offered. INK is the only currency accepted for all transactions carried out on the CVproof platform. They can be used for purchasing goods and services on the platform, as well as for paying commission fees. There are a number of service payment types, including: the credential holder paying the institution for the required documentation, paying recruitment agents, applications fees, and accessing news publications. They can be purchased initially during the CVproof ICO.